Thank you for your prayers and for your financial support this past month. We can�t say it enough: it is you who makes our mission possible, and who keeps us on the air 24 hours every day. Although there�s still plenty of winter ahead for us, the light brings us the promise of an eventual spring, and again, we thank you, sincerely and prayerfully. 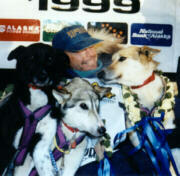 top ALL SMILES (left): Iditarod Race champion Doug Swingley poses with his lead dogs about a half-hour after reaching the finish line on Nome�s Front Street. His dogteam journey from Anchorage took 9 days 14 hours, averaging 4.84 MPH. KNOM news director Paul Korchin flew the entire 1,100-mile trail, part of the station�s extensive coverage of the race, which has won many awards. In addition to interviews and hourly reports assembled by the whole staff, Paul and hardy reporters Tom Busch and Michael Warren cheered every one of the race�s 47 finishers over the air live. It�s a time of extremely high listenership for our little mission station. This photo was taken by Bob Hallinen of the Anchorage Daily News, and is used with permission. Bob snapped some absolutely breathtaking images of this year�s Iditarod. INSPIRATIONAL SPOT: All that I am and all that I have, You have given to me. So Lord, I give You today, all I think and do and say. All that I am and all I can be, to these I give You control. But Lord, I ask You to stay and guide me through this day. CONNECTED: Try our website, www.knom.org. It includes the past two years� Nome Statics with most of the pictures in color? and several historic Statics, including the very first issue, September 1966. You�ll find a hundred other photographs and lots of information. If you�re not a computer guru, perhaps a neice or a grandchild can find us for you. Many local libraries offer free Internet access, with staff who are willing to guide you. Look for us! INSPIRATIONAL SPOT: The will of our God and Father must be obeyed, even to our last breath. Perfection comes from conforming our will, not to this world, but to our Father�s world. 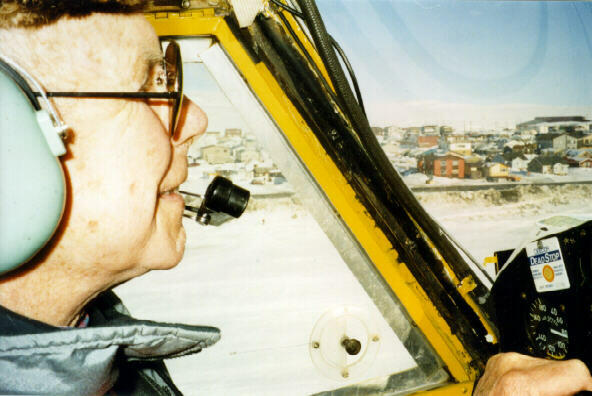 top AIR APPARENT: (Left) George Murphy, KNOM�s Race pilot for many years, takes off from a smooth strip of sea ice off the coast of Nome. In this photo, taken at an altitude of about fifty feet, you can see Nome�s Front Street, which follows the shoreline. Once chief pilot for the �Iditarod Air Force,� George still helps out the race, hauling supplies as well as dogs left by mushers at checkpoints due to minor injuries. The rest of the year, he operates Alaska Bush Expeditions out of his home town of Willow, Alaska. INSPIRATIONAL SPOT: However quietly we speak, He is so near that He will hear us; we need no wings to go in search of Him but have only to find a place where we can be alone and look upon Him present within us. top BOOSTER UPDATE: In the second week of April, we will begin to promote a massive contest, to distribute antenna boosters to our most distant listeners. Starting May 1st, we will be awarding 10 to 15 of the boosters every day. In technical terms, these boosters, used at the receiver, increase signal level by 30 decibels. To get that much boost at the transmitter, we�d have to increase our power to 25 million Watts! Distributing these little units is an extremely cost-effective way to encourage more people to listen, and for longer periods of time. Special thanks to friends of our mission who are paying for this astounding project. INSPIRATIONAL SPOT: Some people complain because God put thorns on roses, while others praise Him for putting roses among thorns. top A hearty prayer of THANKS to Linda Raab, who coordinated our coverage of the Iditarod Race, her twelfth year of helping out at this busy time of year. Linda is a generous, caring, and very witty young woman, and we enjoy her company immensely. Please join us in patting Linda on the back for a job well done! KNOM�s 25,000 Watt signal beams inspiration, Catholic worship, education and companionship into isolated Eskimo and Indian villages throughout 100,000 square miles of roadless western Alaska. Our only source of income is the generous contributions of people like you. YOUR PRAYERS ARE REQUESTED: On March 14, the only two children of Jim and Pat Tighe were killed in a traffic accident. Shelley was 19 years of age; Megan was 16. Please remember all of them in your daily prayers, won�t you? The Tighes met while they were KNOM volunteers in the 1970�s. Jim was an announcer, while Pat worked at the local hospital, lived as a volunteer, and donated her entire salary to help keep the mission operating. They are very special people, and we know that you will grieve with them and pray for them especially hard. INSPIRATIONAL SPOT: Do not pray for a lighter load. Pray for stronger shoulders. top Thank you to all of our friends who made possible the DUBBING STATION, where Program Director Ric Schmidt is recording a program. It�s a mini-studio, which we use to copy tapes and record programs, such as the weekly Passionist Mass, into our computer system for playback over the air. The two identical units side by side are cassette decks. Just above the right-hand deck is a compact disc player. The dubbing station shares a room with our computers, which use noisy cooling fans. Foam glued to the wall helps reduce their sound. INSPIRATIONAL SPOT: Life can be understood when you look back. But life must be lived looking forward. 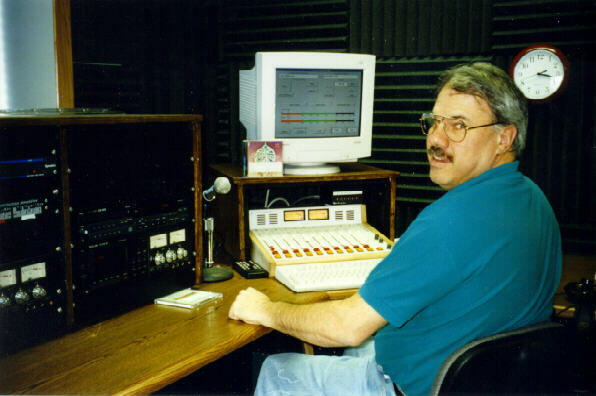 top 25 YEARS AGO: Longtime KNOM volunteer and business manager Therese �Tweet� Burik had passed the test and held an FCC license. But she had always refused to go on the air. April 1, 1974, volunteer Roy Wells asked Tweet to watch the �board� (the audio mixing console) on the air for a few minutes. A half-hour later, he was still absent, and Tweet was forced into deejaying her first and only program. Today, Tweet is executive assistant for Bishop Michael Kaniecki, SJ. Please consider adding missions like KNOM to your will. Your kindness will long endure. 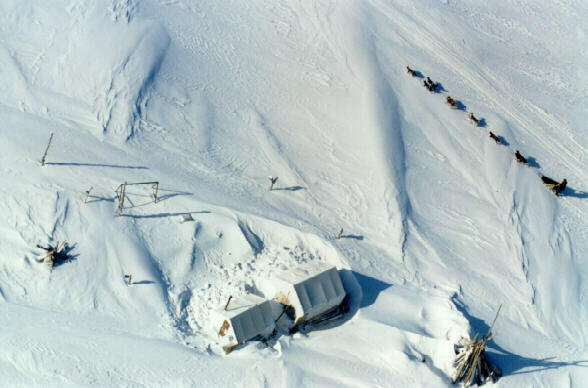 COLD MUSH: (left) On St. Patrick�s Day, a lone Iditarod dogteam passes shacks that are used as summer fish camps about 20 miles east of Nome. Several such camps are built along a remote, barren strip of sand, miles long and a quarter-mile wide, with the Bering Sea on one side and a lagoon on the other. You�ll notice that the brutal wind has cut a channel around the buildings. The teepee-like structure is a stash of driftwood, used for heat. We enjoyed a few unusual days of +35 in March, although April 29th is the average first day that Nome�s high temperature rises above freezing. By early June, most of the snow will be gone, revealing coarse sand and beach grass. This intriguing photo was taken by Bob Hallinen of the Anchorage Daily News, and is used with permission. COUNTING UP: By the end of April, KNOM will have already broadcast 11,200 inspirational spots during 1999, and an equal number of educational ones. That, of course, is in addition to hours of religious and educational programming, the Mass and daily Rosary. Once again, we thank you for your generous financial help, and for your prayers, both of which keep us on the air. May God richly bless you for your goodness to the remote village families whom we serve! May He be present with you in a special way, and with those whom you love.